A group of men, who are accused in 2015 Dadri lynching case of beating a Muslim man to death over beef rumours reportedly had front row seat at a rally of Uttar Pradesh Chief Minister Yogi Adityanath on Sunday. CM Yogi was campaigning for the upcoming Lok Sabha election starting from April 11. Mohammad Akhlaq who was lynched to death in 2015, alleged killers is out on bail. 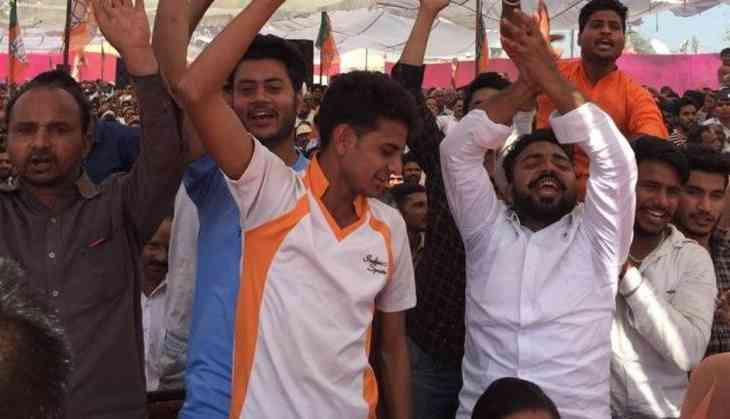 Four men including main accused Vishal Rana were seen cheering from the front row when Yogi Adityanath addressed an election rally in Bisada village of Greater Noida, where the killing took place. On September 28, 2015, a mob allegedly attacked Mohammad Akhlaq and his Son Danish at Bisada village in Dadri over suspicion of cow slaughtering and stored its meat in his freezer. The mob dragged Akhlaq out of his home and lynched. He died due to his injuries on the spot, while his son Danish was also beaten up brutally but survived. Akhlaq's family was forced to leave the village in the tense aftermath of the killing that left the area divided. Eighteen locals residence, including three juveniles, were charged with murder and assault in the case in Dadri lynching case. However, the three juveniles were released on bail by the high court and Rupendra Rana has been out on bail after spending 2,5 years in jail.